Domino, a lop-eared rabbit, has visited me quite regularly since Mrs Robson rescued him last year. The reason for that is his overgrown incisors (front teeth). This problem is quite common and is thought to be inherited. Rabbit's teeth continue to grow throughout their lives. Rabbit incisors are reported to grow 12.5 cm per year. The length of the teeth is controlled by the upper teeth grinding against the opposite teeth in the lower jaw. In most inherited cases the problem is mandibular prognathism - this means that the lower jaw is longer than the upper jaw. 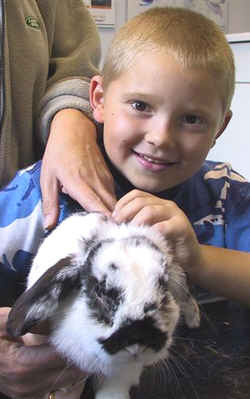 The problem starts in rabbits of 8 to 10 weeks of age. We see them present in the surgery at 12 to 18 months of age. The lower incisors grow very long and protrude from the mouth. They do not meet the upper teeth and grind them down, so these keep growing as well and usually curve unseen in the mouth itself. They can do damage to the gums and cause a lot of distress. Rabbits with overgrown incisors will have difficulties eating, and carrots will be left untouched. They will lose weight, have problems grooming themselves and can not eat their night faeces, which may result in a dirty back end. If the mouth is painful because the teeth are damaging the gums, the rabbit may also drink a lot.It is important to have the teeth shortened by an expert at regular intervals. Because the teeth grow around 1 cm a month, this may be every 4 to 8 weeks. It is not a painful task and rabbits tolerate it very well. 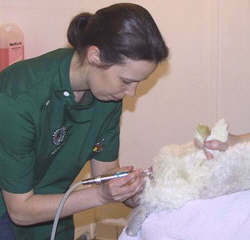 In our practice the rabbit is held on its back by a nurse, while I burr the teeth short with a dental drill. 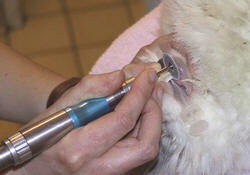 Clippers are not advised as the teeth may split in the length and cause root abscesses. Because the maloccluded incisors are no longer functional, and merely serve as an obstruction to feed, we decided to remove Domino's incisor teeth under a general anaesthetic. Domino was intubated, as it is a long and complicated procedure. The teeth are firmly attached to the jawbone with a periodontal ligament, which needs to be elevated all around the tooth. The teeth are very long and curve, and they will grow back if they break off. Domino's incisors were successfully removed. He quickly woke up after his anaesthetic and went home the same evening. Rabbits adjust very well, but food items must be prepared in bite-sized particles. His carrots may need to be chopped or grated from now on, but frequent visits to the vet will be sliced!